This entry was posted on September 13, 2012 by Scott Ridl. This customer is Phyllis Fritz, the beautiful mother of Judy Attaldo. She is a friendly NY lady who is very inspirational to many oxygen users by showing off her skills at the skate park, skateboarding! Phyllis enjoys her SeQual Eclipse 3 so much she literally takes it everywhere she goes, grocery store, motorcycle trips, 4 wheeling, skateboarding, and for everyday activities! The portable oxygen machine has made the life of this lovely customer much more enjoyable! 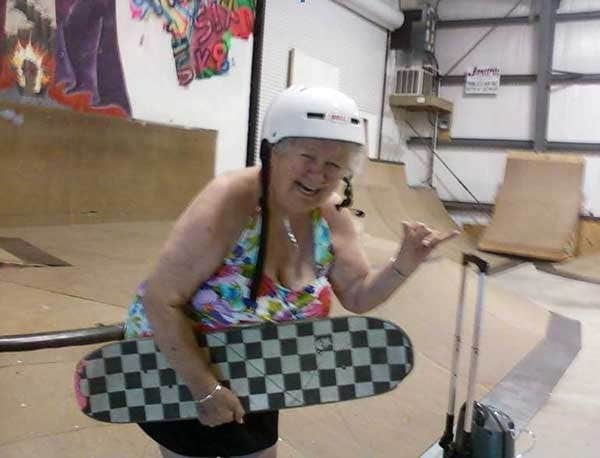 Even if your grandchildren wish to take a field trip to the skate park, American Medical has a wide variety of machines that will meet your needs and make this possibility a reality.